Cute stone in an apple green color! Very bright and good cut - this stone just needs to find a good home! 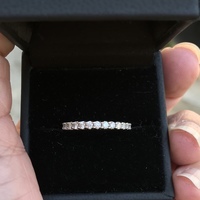 I am selling the diamonds in this ring, 6mm each and 1.5ctw Please see the video to see the sparkle of this ring: http://www.youtube.com/watch?v=Cj13N-cISO8 Please ask any and all questions, all sales final, no returns. Sri Lankan blue spinel cut by Dana Reynolds Medium dark blue 8.1 x 6.5mm Oval 2.005 carat Vs2 bubble inclusions (hard to see with just the eye) This is a great Blue Spinel. It is a nice stone, well-cut, nice blue color during the day shifting to violet at night (flourescent). Stone weighs a hair over 2ct, and measures 8.1x6.5. It is nearly eyeclean, just some tiny bubble inclusions, I can barely make them out. The reason i'm selling the stone is simply that I bought it hoping to expand my collection past buying just green stones. And it turns out that i'm just not that branchy of a person. I should have known better as the only unset items in my collection are the ones that aren't green! It's not fair to the stone to let it languish in my jewelry box unset when I know that many of you out there would give it a loving home and really enjoy it. It's a very lively and pretty stone with precision faceting which is rare and increasingly hard to find in this size. I was known as Redfaerythinker on PS for over 5 years until I joined the trade. As I am not a retailer, I consider all sales to be final. Lovely x-prong platinum trellis semi-mount made by Whiteflash. Will hold a 6mm stone. In very good condition--only lightly worn and with the center stone carefully removed by Whiteflash. Please note, this setting is slightly modified from WF's standard version, with the shank closer to 3mm at its widest point rather than 4mm. These more delicate proportions perfectly suited a .80 ct (6mm) diamond. Currently a size 4.75 and easily sizable. Sells for $1295 new at WF; asking $600. Reasonable offers will be considered. *Center diamond shown in some photos is not included in this sale. I have been hoarding too much jewelry and it is time for me to start cleaning house. I am going to start small as it is very difficult for me to let go of my pieces. First up is a lovely and timeliness Palladium engagement ring setting (marked "Palladium LC"). This is currently in a size 6 and can be easily sized by your jeweler. It can hold a stone around 0.6 ct. I can ship from Toronto, Canada or New York City. Just reduced - I am asking $120 plus shipping and insurance. Paypal accepted! Sale is final – please make sure you ask questions before you buy. The is a 1.03 princess cut diamond Measurements: 5.46 X 5.18 X 4.06 mm Weight: 1.03 ct Proportions Depth: 78.5% Table: 74% Girdle: Medium to Very Thick, Polished Culet: None Finish Polish: Good Symmetry: Good Clarity Grade: SI1 (As shown on the certificate, the inclusions are on the edges of the diamond not in the center) Color Grade: F Florescence: Inert Comments: French Tips This is graded by AIG, certificate number 1006705 on 9-22-2000. The ring was appraised for 6800 in 2002. The diamond is set in a platinum setting size 6 1/4 and can be resized. I have other pictures, please email and I will send them. I am asking 3500 but will entertain any and all offers. Thanks for looking! This is a very striking kite set pendant, with 4 invisible set princess cut diamonds., 4x.10ct. It is a great size 6mm square (approx). Handmade by Grounds Jewellers in Melbourne and bought for me by my husband. Necklace is 18" and 9ct rose gold., .40 ct. G/H diamonds Item is located in Melbourne Australia, so shipping will depend on your location and the method you want it sent. I have sold via DB previously with a very positive result if you need a reference. If you are interested but would like a valuation please contact me as I am willing to have this done if there is interest. Please ask if you have any questions. Gorgeous rose gold bracelet in 9ct gold, with rose gold locket and safety chain. Weight is 25gms. I do love this bracelet, but I am saving for a new piece. I also have a rose gold necklace listed which is shown in the final photo. Any questions please ask. Listing is for the bracelet only. All sales are final unless misrepresented. I am in Australia so shipping will depend on your location and shipping method. 1cm wide 9ct rose gold necklace with bolt ring closure. This necklace was custom made and has great presence on. I really love it, but I never wear it anymore. Weighs 50gms. Shown in the final photo with the bracelet. Necklace only included in this sale. No returns unless item not as described. shipping will depend on your location and the method you prefer (ie registered, insured etc). Please contact me with any questions. I am also listing a rose gold bracelet that is very similar in style. Two gray oval spinels 6.75x5mm 7x6mm I purchased these to use in a jewelry making class and ended up not needing them. Lot of three blue oval spinels. Darker Oval: 5.75x4mm Lighter Ovals: 5x3.75mm 6x4.75mm I purchased these to use in a jewelry making class and ended up not needing them. Lot of three red spinels. The ovals are 7x5mm and 6.5x4.75mm The other is one is 8mm (long side) 4mm the other direction. I purchased these to use in a jewelry making class and ended up not needing them. Three 4mm Rhodolite Garnets. These are bright and lively in person. Well-matched. 6.25 x 7mm This is a beautiful stone. Eyeclean at 10 inches but under magnification you can see little bubbles. Puts off lots of flashes of red and blue. I realize some of the photos are blurry - that is an attempt at showing the color. Stunning 100% authentic Tiffany 7-diamond band. The sparkle from these diamonds is incredible! 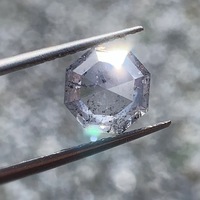 Diamonds are F-G colored VS1 clarity, weighing a total of just under 1 carat. This ring is stunning, set in 18k yellow gold. The version of this ring is no longer sold in Tiffany stores, the same carat ring in prong setting retails for over $6500 at Tiffany' s. This ring can be worn as a wedding band or as a stand-alone eternity. 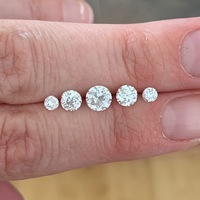 I love this style eternity, because you have full finger coverage, but no bothersome diamonds between the fingers or on the inside of the hand. Looks amazing when worn. This ring is in perfect condition, was hardly worn, and looks new. Comes with Tiffany pouch. I had this ring sized from a 5 to a 5.25 by Tiffany's, they did a perfect sizing job, and this ring could be re-sized again if needed. I am Sparklypoodle on PS. Please ask all questions prior to purchase, all sales are final. Thank you.